Last night it was Disrupt your Night in the #24daysofdisrupt. It was an incredible experience for our family. It is so easy to get into the routine of our Monday nights. 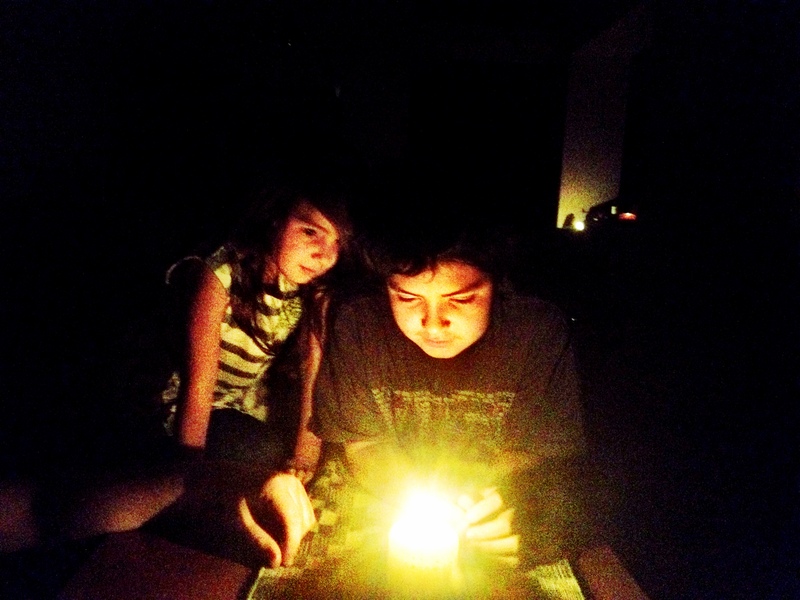 Tonight, instead of turning on electronics, spend the night without electricity. Light candles and spend the evening in simplicity. This activity will help you see through the eyes of a family who lives without basic amenities. This evening, ask God what action He is calling you to on behalf of those who live without this luxury that we consider a necessity. At first it was really difficult. It was Monday after all. We come back from work, school, swimming and since we are about to go on vacation to Mexico we needed to pack, not to mention decorate the house because we are running out of time. When I told my family, let’s open the second door of our Amor Advent calendar in the morning I already knew what it would be about (after all, I had something to do with it). After much complaining from my older son, and a lot of screaming from my daughter (she was afraid of the dark). We proceeded to turn off the lights. I told them we would only do the disruption during dinner and we would then continue decorating the tree. As we began lighting each candle, something wonderful began happening. The winning stopped, the screaming turned into cheer and our family sat at the dinner table in peace. During this time we took the opportunity to revisit the first disruption and Danny asked our children what was really important to them. I was fully expecting (particularly from our four year old daughter) answers like my friends, my toys, my kitchen, leaves (she is obsessed with leaves, thanks a lot Autumn). Instead we got things like generosity, kindness, learning, and not stabbing people— OK, so this last one is a bit creepy, but again we were in darkness. My son added things like family time, music and patience. He’s a teen, so no surprises there. After dinner we moved to the living room, then our son read to us the story of the Gift of the Magi from the blog post. And we discussed Matt. 6:25-34 and the ways in which God has shown his favor and what response should we take in return. Our family was united, we had a draft to our Family Mission Statement sitting on the coffee table, and more importantly we were being family. The hours went by flying — talking, laughing, staring at the candles. Yet, like I promised them, we turned back the lights before bed to do some Christmas decorating while listening to our favorite Holiday songs. Everyone was in bed earlier than usual — another positive side effect of turning off the lights for an evening. While we had the opportunity to pause our daily scramble and we recognized that we would like to do it more often, we recognized what a blessing is to be able to turn on the light to run to the bathroom and not crash with the furniture or trip on our black dog for example. The day escaped us. 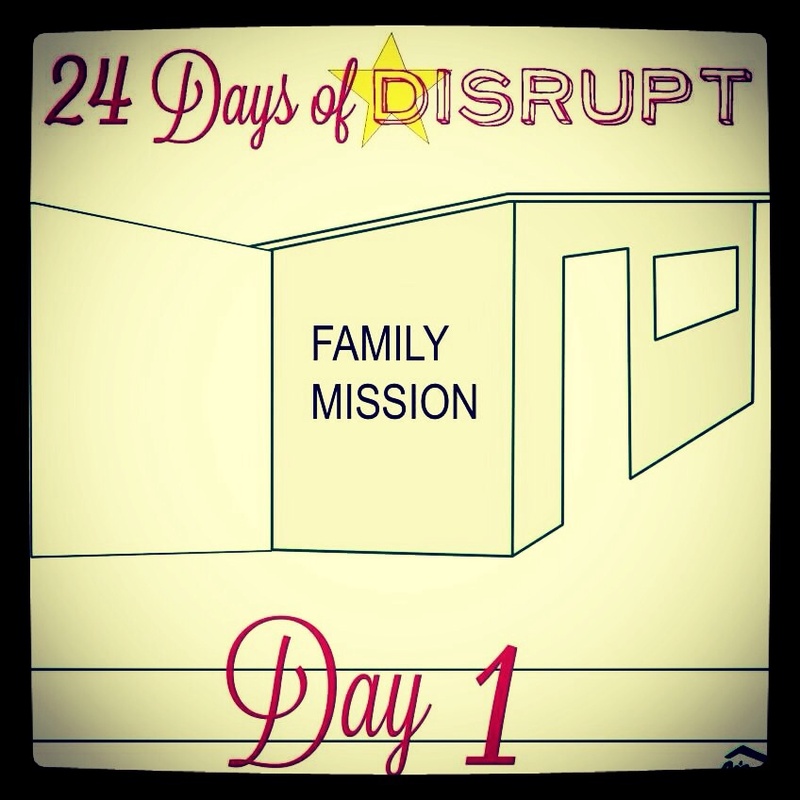 We didn’t do our family Mission Statement for Day 1 on 24 Days of Disrupt. We knew it was important and my family has been hearing about #24daysofdisrupt since the day we were still planning beach days. But at the end a series of events simply didn’t allow us to carry it through. In the past we created the “Thursdays family hangout” which it was supposed to be the time to really evaluate what it was important for us. We quit when it became too hard to keep with our schedules. And this is exactly why it’s important to create a Family Mission Statement. To have a map. While we have a true North in Jesus, without an actual plan our best intentions fall short and it’s easier to give up to the urgent instead of what is truly important. Not necessarily true for today though. For today I choose to extend grace to every member of the family, including myself. We’ll revisit this challenge, hopefully soon. 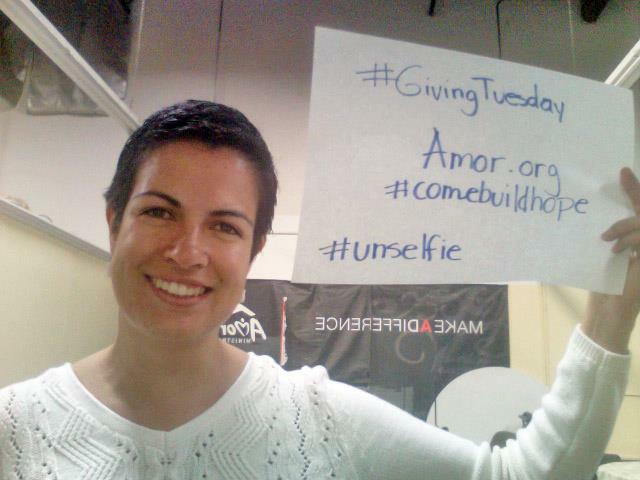 In the meantime we’ll keep on opening the doors of our Amor Advent calendar, opening our Bibles and praying for God to truly leave our hearts open and disrupt our Christmas.